Today marks the 24th anniversary of the world&apos;s worst industrial disaster—one that has been called the "Hiroshima of the chemical industry" and that took place in Bhopal, India. Shortly after midnight poison gas leaked from a factory in Bhopal, India, owned by the Union Carbide Corporation. There was no warning, none of the plant&apos;s safety systems were working. In the city people were sleeping. They woke in darkness to the sound of screams with the gases burning their eyes, noses and mouths. They began retching and coughing up froth streaked with blood. Whole neighborhoods fled in panic, some were trampled, others convulsed and fell dead. People lost control of their bowels and bladders as they ran. Within hours thousands of dead bodies lay in the streets. We had no idea that Simi Valley was the site of America&apos;s first nuclear accident (obviously we should watch more History Channel). At the Santa Susana Field Laboratory, a liquid sodium reactor had a partial meltdown in 1959; the facts weren&apos;t made public until UCLA investigated 20 years later. Researchers speculate that the radiation released was as much as 240 times that of the Three Mile Island accident. Exactly what was contaminated in the area, and by how much, was never accurately measured. Yikes, just 30 miles from downtown LA. 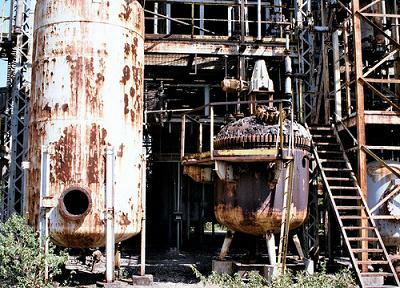 "The site has never been properly cleaned up and it continues to poison the residents of Bhopal. In 1999, local groundwater and wellwater testing near the site of the accident revealed mercury at levels between 20,000 and 6 million times those expected. Cancer and brain-damage- and birth-defect-causing chemicals were found in the water; trichloroethene, a chemical that has been shown to impair fetal development, was found at levels 50 times higher than EPA safety limits. Testing published in a 2002 report revealed poisons such as 1,3,5 trichlorobenzene, dichloromethane, chloroform, lead and mercury in the breast milk of nursing women. In 2001, Michigan-based chemical corporation Dow Chemical purchased Union Carbide, thereby acquiring its assets and liabilities. However Dow Chemical has steadfastly refused to clean up the site, provide safe drinking water, compensate the victims, or disclose the composition of the gas leak, information that doctors could use to properly treat the victims." And if you have the stomach for this personal story, Aziza Sultan, a community health worker at the Sambhavna Clinic shares her personal account of that horrific night. The pursuit of justice around the Bhopal tragedy is also a study in effective strategizing for positive change. The courageous residents of Bhopal, also known as Bhopalis, have captured the energies of social justice activists and students around the world. Bhopali women and children have performed numerous direct actions aimed at the most powerful leaders in India and America. The Bhopal Medical Appeal and the Sambhavna Trust Clinic were created to provide treatment and rehabilitation for victims and their families. And the activists&apos; relentlessness has finally paid off, and last month the government of India promised to create an Empowered Commission on Bhopal and take legal action on the criminal and civil liabilities of Union Carbide and Dow Chemical. 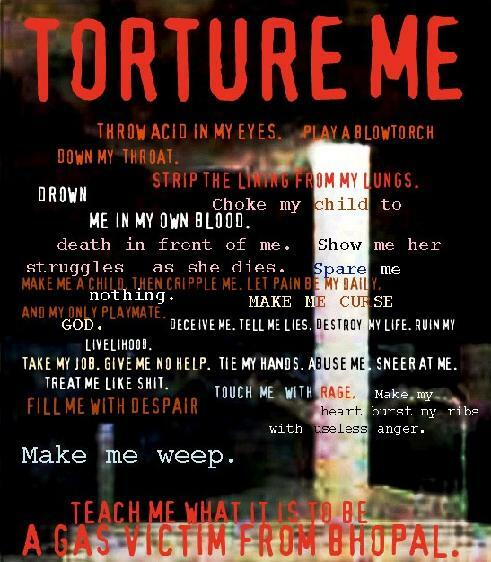 In a movement of solidarity, students at colleges and universities around the world have for years engaged in online actions, sent letters and faxes to the Indian government, and hosted thousands of events at their own campuses around the issues of the Bhopal tragedy. Dow, the creator of Napalm, Agent Orange and responsible for Dioxin related deaths and diseases worldwide is not the only corporation that kills and maims people and causes irreparable damage to the planet. Wherever we may live, corporate greed and industrial poisons affect our lives and health through slow and silent Bhopals. 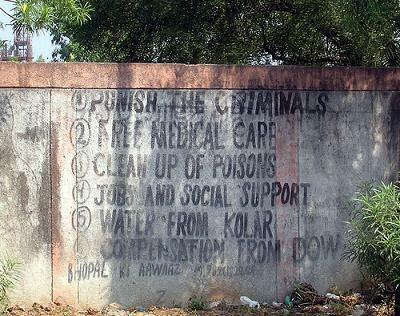 Justice in Bhopal means justice for the poisoned everywhere.